JICSBS, December 1977, p. 34, no. 77. Hong Kong Museum of Art, Snuff Bottles of the Ch'ing Dynasty, 20 October-3 December 1978, p. 49, no. 9. Hong Kong Museum of Art, Snuff Bottles of the Ch'ing Dynasty, 20 October-3 December 1978, no. 9. This exceptional bottle undoubtedly ranks among the finest Imperial painted enamel bottles, a group in which masterpieces are standard. The subject matter clearly shows the influence of Jesuit artists at the Chinese Court, who passed their skills on to the craftsman employed at the Imperial workshops at Beijing. French and Swiss painted-enamel panels and other objects were sent to the Court at Beijing throughout the first half of the Qing dynasty to inspire and instruct the Court enamellers and ingratiate the Jesuits with the Emperor. During the Qianlong reign depictions of European figures were common. Popular among them were women with cherubic male children loosely clad in clothing with a mass of folds painted with a combination of sapphire-blue, ruby-red and rich orange-yellow enamel which finds its exact counterpart in French and Swiss enamels of the late-17th and early-18th centuries. The Palace enameling workshops for metal and glass reached an artistic peak during the first half of the Qianlong reign. A combination of intense Imperial interest, the fruits of the Kangxi and Yongzheng Emperors' contributions to enameling in the various media, and proliferation of both Court artists and Jesuit missionaries involved in designing and painting the wares, resulted in some of the finest examples ever produced in China. The present example, from the early Qianlong period, epitomizes this zenith in the production of enamel on metal. An artistic device used by Palace enamellers throughout the Qianlong period was stippling: the gradation of shade or color by applying a mass of tiny dots. Technically, this allowed for a wide variation in intensity of color without constantly changing the saturation of the enamel. The alternative was to use different washes so that the intensity of the enamel was diluted. The present bottle is predominantly stippled to produce shading and chiaroscuro. 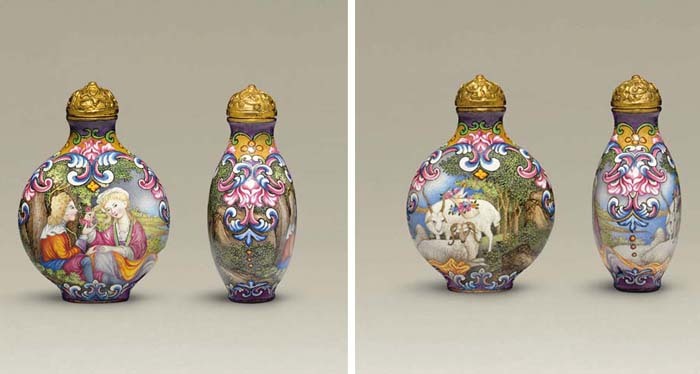 An Imperial bottle from the J & J Collection is painted with a very similar palette, and like this bottle, has European figures on one side and goats on the other. See Moss, Graham, Tsang, The Art of the Chinese Snuff Bottle. The J & J Collection, no. 171. Another example with European figures painted in a very similar fashion, and possibly by the same hand, from the J & J collection was sold in these rooms, 29 March 2006, lot 29. Compare also an enameled copper bottle in the Imperial Collection in Taiwan which is likely by the same designer or enameller (Snuff Bottles in the Collection of the National Palace Museum, no. 14). Another Qianlong-marked enameled copper "European-subject" bottle, also possibly by the same hand, which has similar border decoration, is illustrated by M. Hughes, The Blair Bequest. Chinese Snuff Bottles from the Princeton University Art Museum, p. 257, no. 356.